🌟 I have read many of Victoria’s books but I always believe in my mind that I haven’t for some reason. I guess that reason is that I haven’t finished this series yet, this has been on my TBR for more than 2 years and I finally read it and can say that I joined the fandom now. 🌟 I knew this was going to be a good book as soon as I read the opening line, and that’s something that Victoria is good at. I always easily get into her books and I am a fanboy for short chapters/ fast pacing, 2 things which are usually found in this author’s books. I was intrigued by the first couple of chapters and this was hard to put down which explains why I finished it quickly. 🌟 The writing is as great as ever and after reading 6 books by Schwab, I no longer question her writing abilities, I go into her books while being sure I will like them. 🌟 The world building and magical system is the strongest aspect in this story so if you are a fan of those, then this book is perfect for you. I was simply fascinated by the rules and wanted more and more. The idea is simple yet very interesting! 🌟 The characters were so fleshed out and my favorite till this point is Holland. Kell is great and Lila has the Inej/ Kaz vibe, if they had a daughter then she would be Lila! The twins were so cunning and evil and I am excited for the next books’ characters. 🌟 The plot was good but not as good as Schwab’s other books, If you like plot-driven books then this may not be the best. Vicious and Vengeful were better at that. 🌟 Summary: The story has a powerful world building and 3D characters but is a bit lacking in the plot aspect. I enjoyed it very much and I believe that it will get even better and that’s why I am giving it 4 out of 5 stars. 🌟 Prescription: For fans of stories with good world building/ characters. For Schwab’s fans who hasn’t read it yet. Tags: A darker shade of magic, ADSOM, Adult, Book Reviews, Book series, Books, fantasy, Fiction, Victoria Schwab. Great review!! 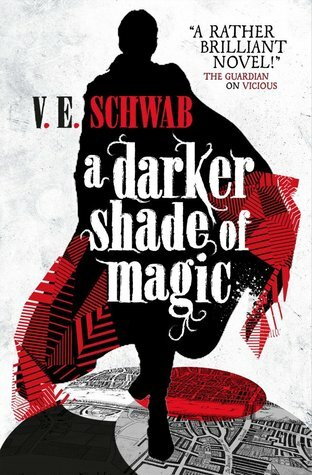 A Darker Shade of Magic is the first Schwab book I read and I absolutely devoured the series 😀 I just started Vicious yesterday and I see what you mean by Schwab having great opening lines and sucking you in right away! Vicious and Vengeful were great, hope you enjoy them as much as I did! So glad you liked this one! Holland truly just gets better by the books. I’m really hoping you like the rest of the books in the trilogy! I found the second one to be a bit slow (still enjoyed it tremendously), but really adored the last book. Happy reading! I also gave ADSOM 4 stars. I haven’t read the following two yet because I feel like it works as a standalone fantasy just fine. BUT I also want to know what happens next. Oh that’s amazing to hear! Holland is so great, one of my fave villains ever! I loved this book and am glad you liked it too. I, uh, loko forward to your thoughts on book 2. I am glad others like Holland because he was so sad in book 1! I will read it soon after I get the books. This is one of my favorite series 😀 And I feel so bad for Holland.